Surely the most unlikely umbellifer, lacking the flat-topped arrays of flowers usually associated with members of the family Apiaceae, but Sea Holly is always a joy to see... as long as you don't sit on it beforehand. Anyone who has made this mistake will get (or will have got) the point! 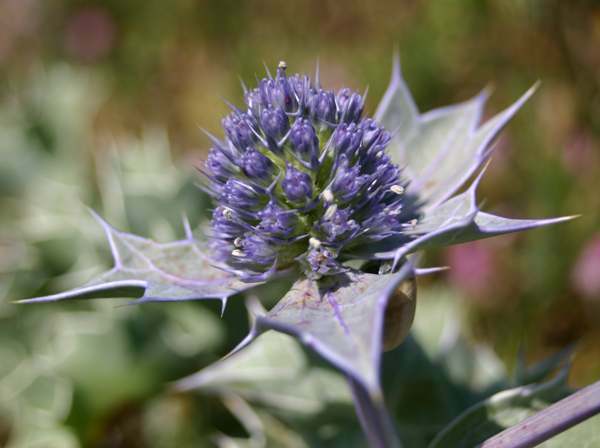 Sea Holly seldom grows to more than 50cm in height. Its tough leaves are evident throughout the year, even after they have turned brown. The flowers of Sea Holly are a very pretty lilac-blue, but the veined, jagged leaves are equally attractive, looking almost as though they have been 'frosted'. This effect is caused by a waxy covering that helps the plant to retain moisture in the wind-swept and often inhospitable places where it grows. The globular umbels of tiny flowers are reminiscent of Teasels, and they are backed by spiny leaf-like bracts that also develop a lovely purplish tinge. 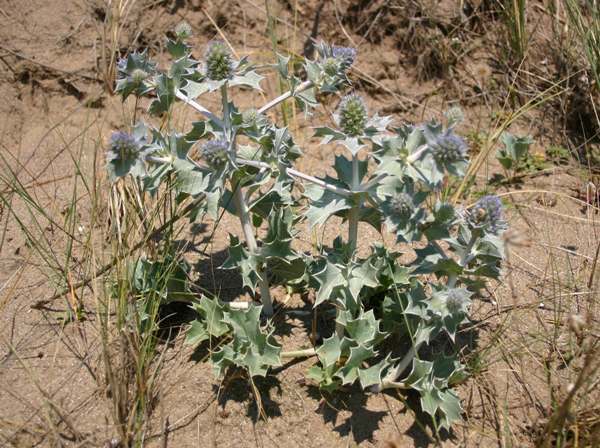 Sea Holly is common on the coasts of Wales, England and Ireland, but absent from most of Scotland and very scarce in the northeast of England. This salt-tolerant coastal wildflower is found in sand-dune systems and even in sandy gravel on shorelines. Eryngium maritimum blooms in Britain and Ireland from July to September. Eryngium, the botanical genus name, is thought to come from the Greek noun eryngion, which means Sea Holly. The specific epithet is in no doubt: maritimum means 'of the sea'. In the distant past candles were made from the roots of Sea Holly and they were considered to have aphrodisiac properties. Extracts from this plant was also used in some herbal remedies. Eryngium maritimum is popular for planting in gardens with dry soils. 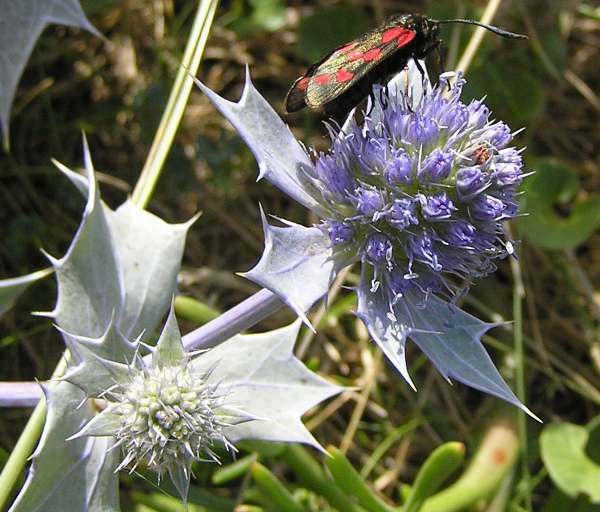 Transfer of plants from the wild into garden flowerbeds may account for the decline of Sea Holly colonies in recent years. Field Eryngo Eryngium campestre is a taller, more spindly plant with smaller umbels of greenish flowers and with only a slight tinge of blue on its bracts and leaves; it is rare in Britain and confined to a few parts of the south coast of England. 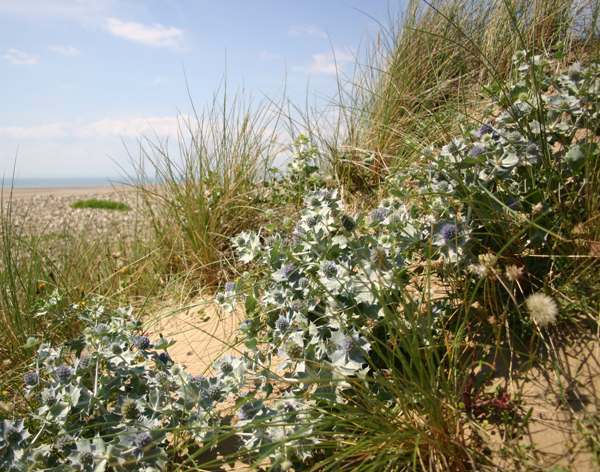 The pictures of Sea Holly shown on this page were taken in Kenfig National Nature Reserve in South Wales.